Anita Bullock has been selling pies at the Carroll County Farmer's Market for 47 years. She started the second year the market was open with only 3 pies. Now she sells 16 different varieties all made from scratch with fresh ingredients. Anita will gladly take your orders ahead of time to be picked up at the Farmer's Market. Summer: Every Saturday in the summer from June 15 through Sept. 7. Winter: Nov. 2 through Dec. 14. To place an order please call Anita @ 410-848-7748. Heather Kuykendall has been selling cakes at the Carroll County Farmer's Market for 24 years. She learned to bake cakes from her mother, Anita Bullock. She sells 16 different varieties including layered iced cakes, coffee cakes, and pound cakes all made from scratch with fresh ingredients. Heather will gladly take your orders ahead of time to be picked up at the Farmer's Market. To place an order please call Heather @ 301-651-4397. Small Farms Ceramics is located in Westminster, MD at 1142 Deer Park Rd. We have been in business for 25 years. We are a full service ceramic shop. Working classes are Tuesday, Wednesday and Thursday to make your own items. If you want a finished item we will be happy to do it for you. We accept orders of any size for any item in our shop. We also have a card making room where we make cards and take orders for special ones. We also make wreaths out of tulle and will do special orders. Please check us out at the Carroll County Farmer's Market. Christmas Dates: Nov. 11, 18 and Dec. 2, 9. 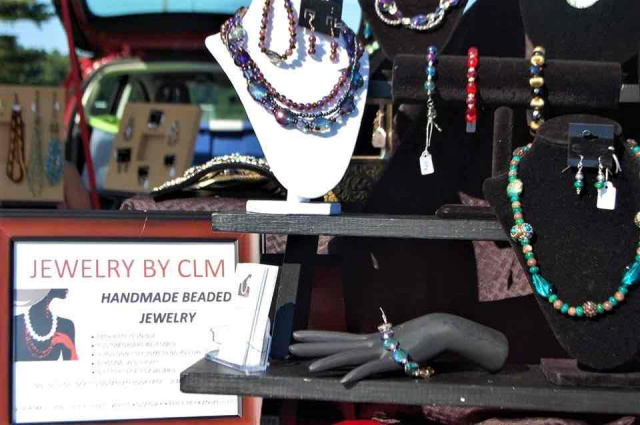 Jewelry by CLM makes beautiful handmade beaded jewelry and crafts. Each piece is unique and lovingly created. We also will happily do a custom order to suit your needs. Besides a stunning array of jewelry we also carry beaded bookmarks, sun catchers, and magnets. Jewelry by CLM has been a Carroll County business for since 2015. We would love to meet you and discuss your jewelry needs. Summer Dates: June 15, July 14, August 10, August 17, and September 7. Christmas Dates: November 2, 16, 23, December 7, 14.